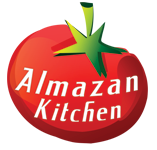 Hi and welcome to first soup recipe on AlmazanKitchen Blog! Do you remember, when in your childhood while you were ill, your grandma, or mother was making you a chicken soup, because it’s magically heals people over centuries? So, we decided to share our family recipe with you. Heal effect is over 9000! Cut 1 onion and 1 garlic head in half. Put it on coals or on hot burner for 3 min. Add 4-6 chicken legs into the pot. Do not forget about 1 tsp. cumin for the good flavor. Salt it with 1/2 tsp. salt. Take your onion and garlic from the coals, don’t peel it, add into the pot. Add spring water, until everything is covered in it. Cook the soup for 3 hours, on low heat. Add some parsley and green onions. Leave it for 5 minutes & then serve. And now you know the secret recipe of our family. Whole vegetables are giving all of its healing powers, coals are charging it while cooking with earth powers, that’s why this soup is so strong in healing. Note: It’s not a medicine, it’s just an extra source for you to get well soon. If you’re sick badly, go to see the doctor asap. Do not sit home, get well soon, if you’re ill, love the nature, and cheers to you all! It looks absolutely delicious. I was surprised that the vegetables were left whole. Wondering if they are cut up, maybe while serving the soup? I must go make some now.